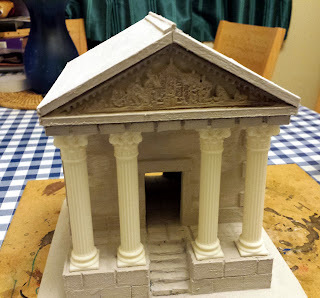 The I finish off the construction of the Mausoleum I have decided that I need a little more decoration on in. In particular, the pediment needs something to make it stand out. I hunted around on Google for a few photos of pediments. Found one or two that I liked and adjusted the dimensions to fit my building. 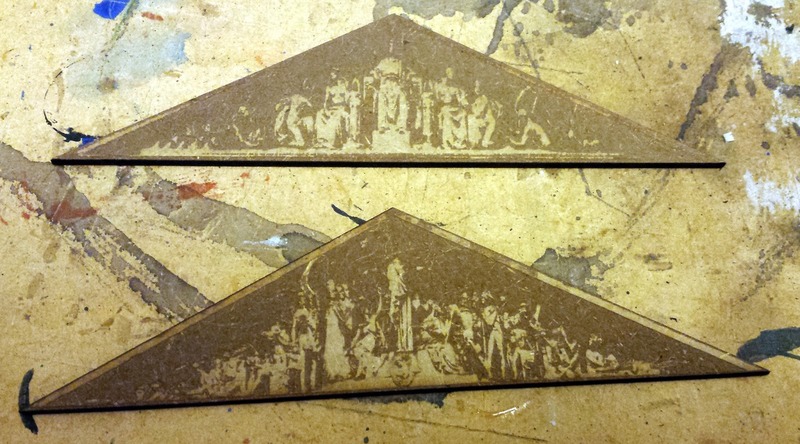 I played around with the contrast, to hopefully make the figures stand out a little, and then laser cut them. As you can see from the following photo, the results are mixed. The figures look OK, but they are still very two dimensional. 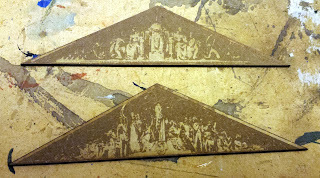 I ran the file again, doing the engraving twice and also cutting out around the edge of the figures. I am much happier with this so I went ahead and glued it in place. Once that was done I gave the whole roof a coating of thinned down tiling grout, as I had done with the rest of the building. Next step, give the whole thing a very light sanding. Then it is on to the painting! 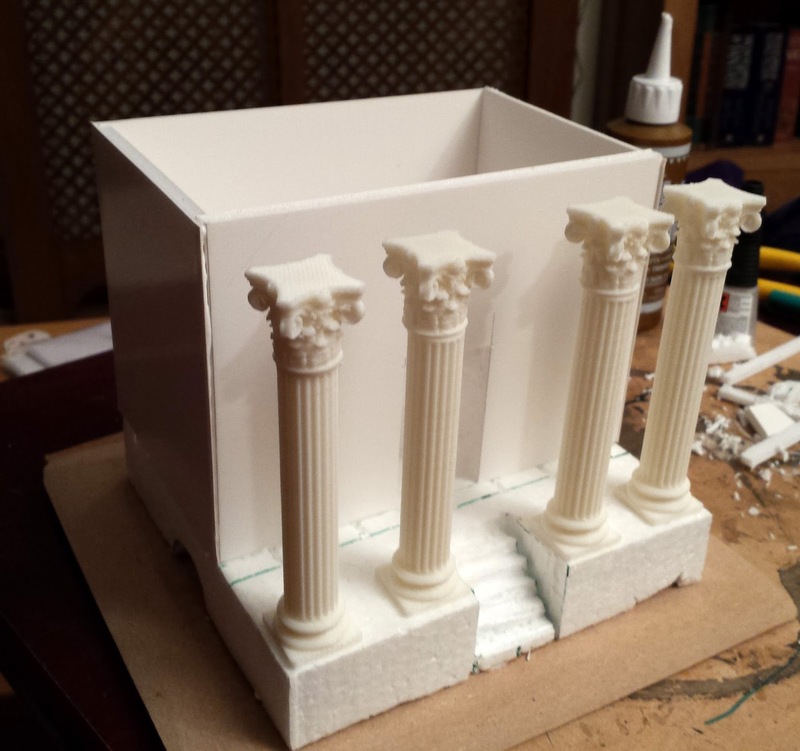 Time to fit the 3D printed columns to he front of the building. These add the character that this build really needed. 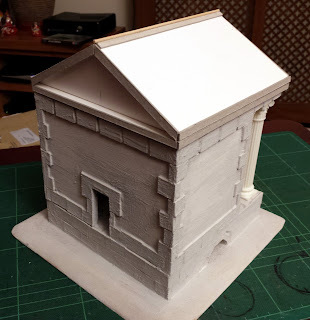 As this is quite a small building there is not much room on the base. I have tried to leave enough room for a figure to fit in behind the columns (line of site being so import...), however, if any of use the lipped bases I doubt they will fit in there. 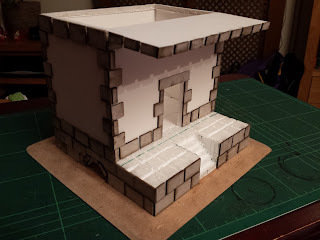 I settled in to build the roof last night. Unfortunately my phone was charging, so I couldn't take any "in progress" shots. It wasn't a complex build though st these photos should be pretty self explanatory. 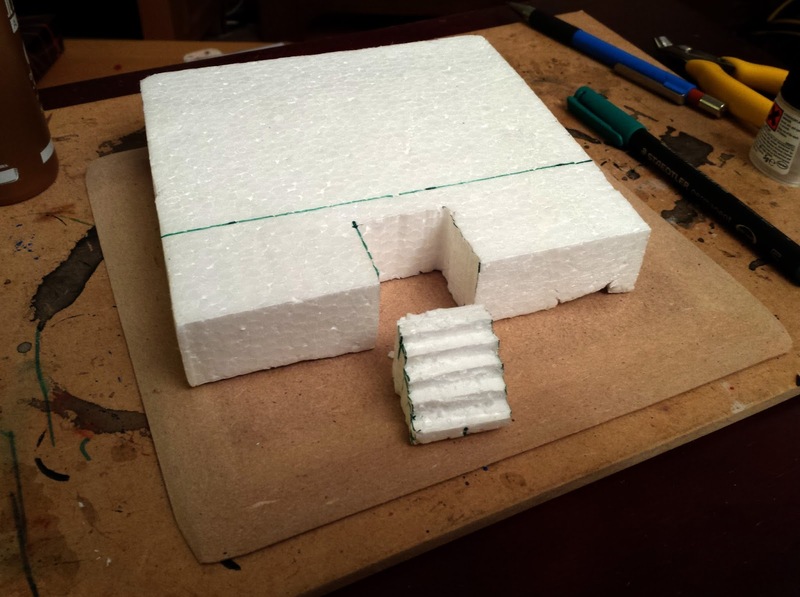 Firstly, I cut a plate of foamcore the size of the whole roof. I then stuck the piece I had removed from the top of the building to the plate, so that it will locate the roof and make it easy to remove. I cut three triangular pieces to give the shape and support of the roof. Then I stuck the two sides of the roof in place. To hide all the edges I simply cut 5mm strips of grey card and glued them over the edges. I then took a thin dowel and stuck that on the apex, just to add a little more detail. 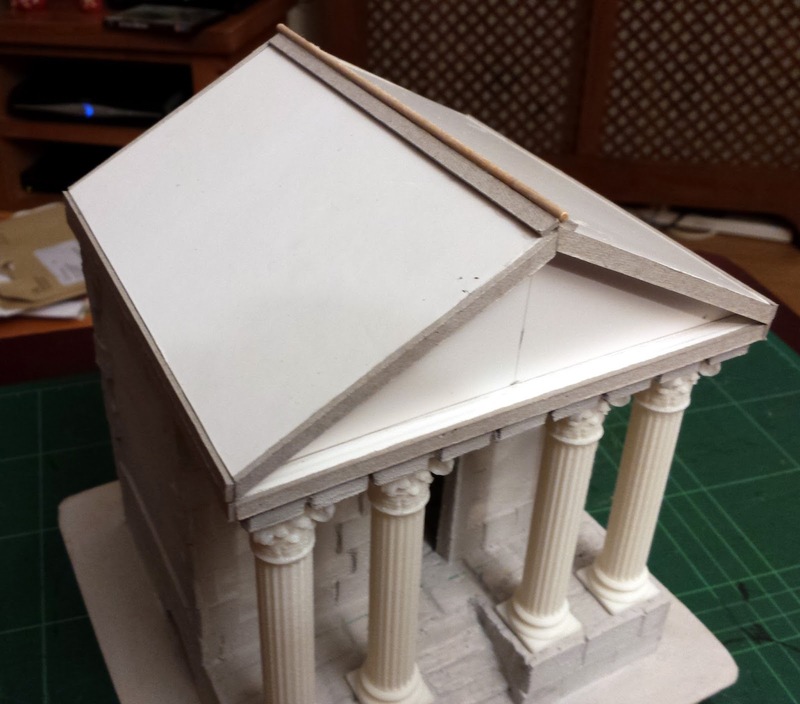 I am looking for something ornamental to add to the pediment (the triangular bit in the roof), as I feel it is a little plain at the moment. 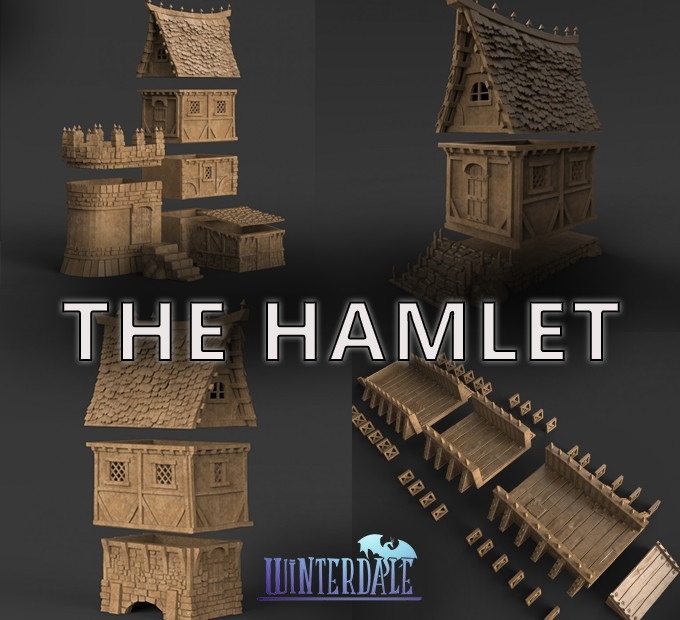 Winterdale - 3D Printable Fantasy Scenery! I have just come across the Winterdale Kickstarter campaign. The rewards for the campaign will be downloadable files that can be printed off as many times as you like and assembled to produce various different building. It sounds like a great way to assemble sturdy characterful scenery, assuming you have access to a 3D printer of course! 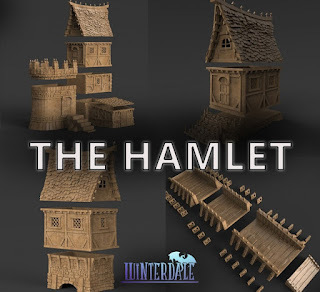 These seem like a perfect solution for Frostgrave players. The basic reward is a versatile cottage or fantasy house and bridge. 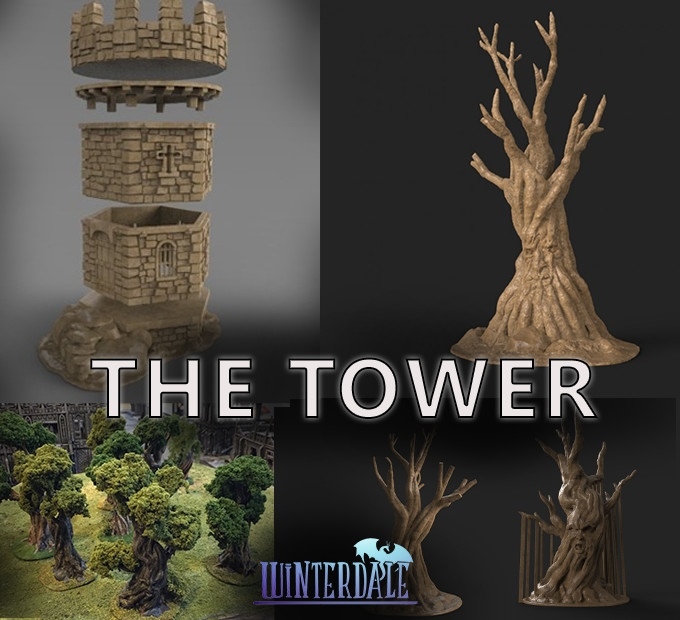 Second up is a tower and three trees. The third level reward are components for a city or castle wall. 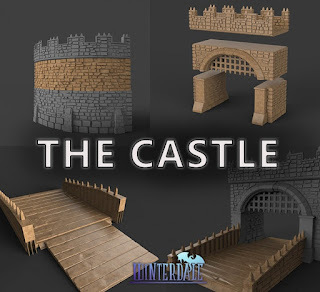 Finally the castle upgrade gives a gatehouse, draw bridge and more bits and bobs to finish off the castle. 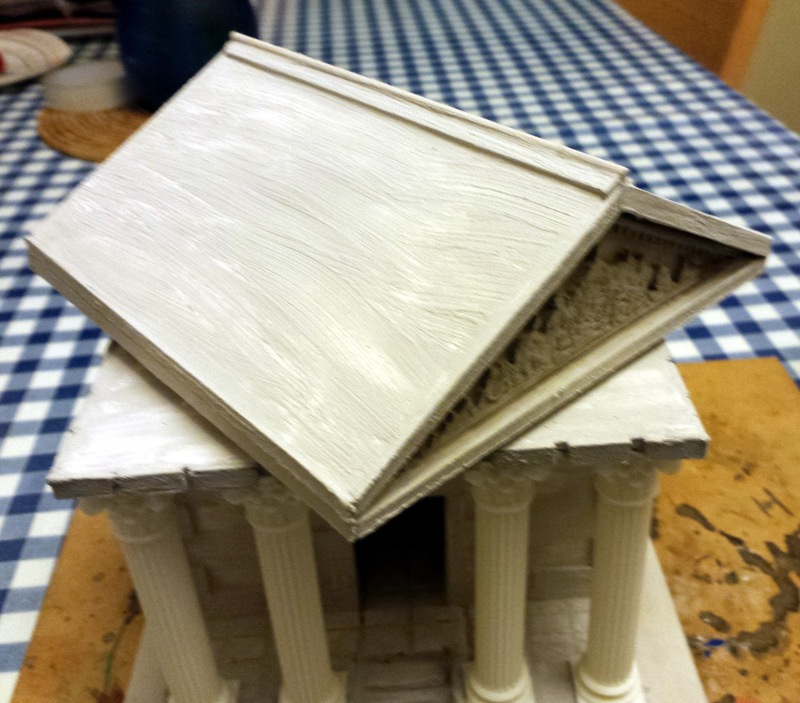 With the main structure of the building in place I have moved on to so detailing now. 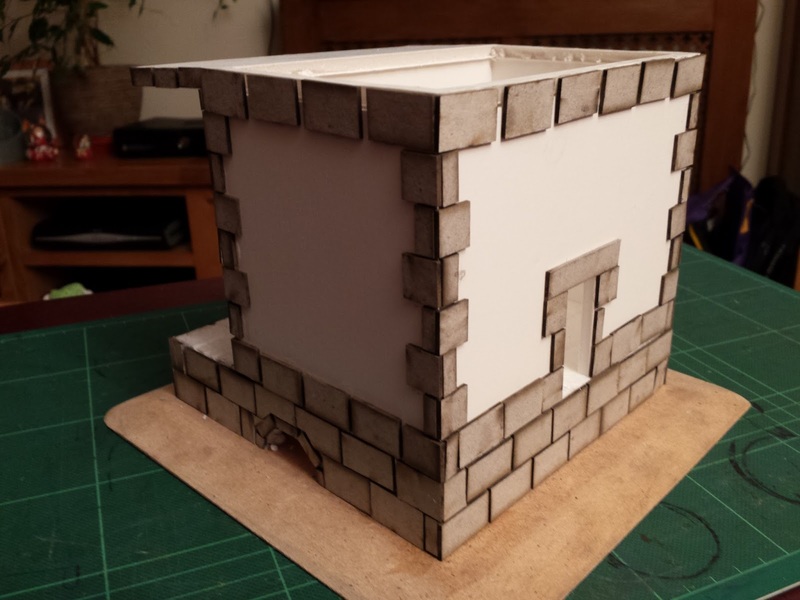 I spent an evening gluing bricks on to the base and defining edges. I think these add a nice bit of character to the building. On a practical level they also hide the joins and give a bit of extra strength to the whole structure. 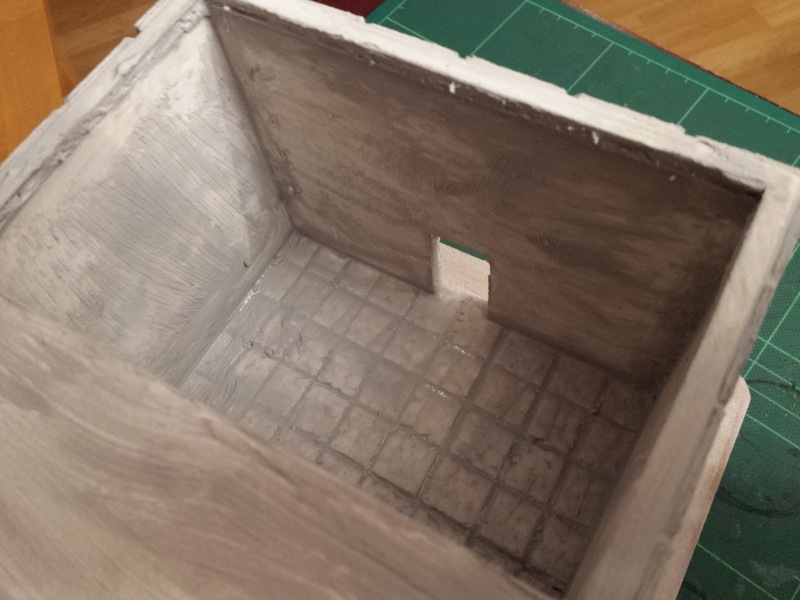 On the sides you can see I have added some fine brickwork around the drain/skylights. The bricks are stuck on in a fairly crude and sometime uneven way. This is intentional and will settle down once I get to the next stage. 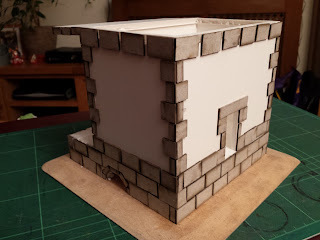 I glued the bricks on with a "Hi-Tack" glue, which is similar to PVA but grabs and holds very quickly. This proved great for the brickwork as the bricks stayed where I put them straight away, with no slipping at all. 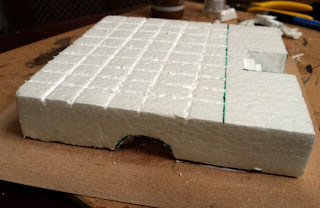 Once the bricks had dried in place I brushed on a good layer of watered down tiling grout. This is deal for filling gaps between the bricks (which is more or less what it is designed for anyway). It has a slightly gritty texture which also helps to give a masonry feel to the structure. 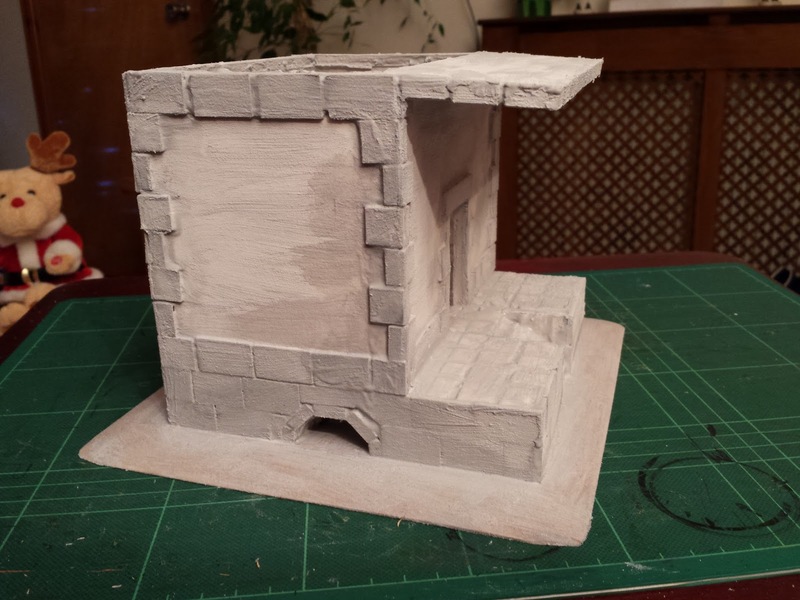 Once, dry I will give the whole model a light sanding down with 400grit wet and dry paper, just to even out the texture a little. I also need to build the stairs for the back door. For a bit of variation I am considering building a slightly rotted wooden stair. 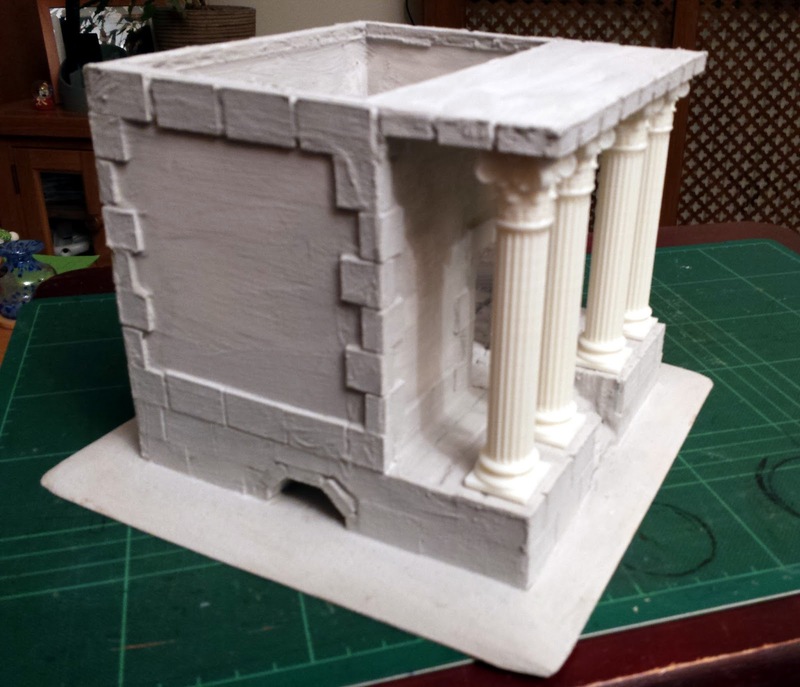 The inside of the mausoleum will be left fairly plain. 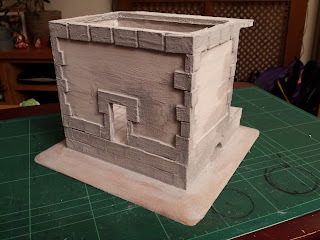 I may not fix the actual tomb inside, so that i can use the building for more than one purpose, once it is complete. Next up I will start work on the roof. Now that the Wizard's Tower is finally finished I am moving on to some of the other scenario specific terrain pieces. 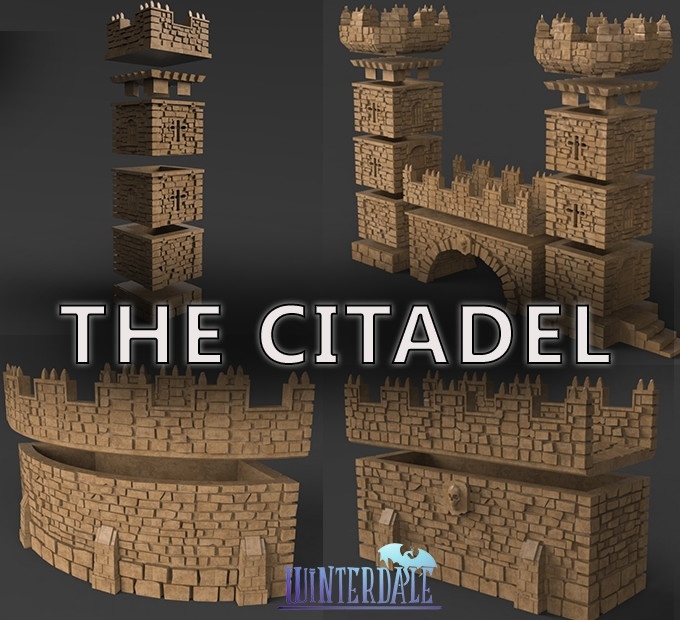 My aim is to keep most of these pieces generic enough that they can be used for other games, as well as non-scenario Frostgrave games too. The Mausoleum is a six inch square building with doors, or in this case, "exit points" on all four sides. Most mausoleums I know of only need one entrance (how many doors do they really need), so to make this work I decided that the side entrances could be either drains or skylights, built into the base of the building. I also wanted a monumental look for the the building and so I decided there should be a platform and columns on the front. 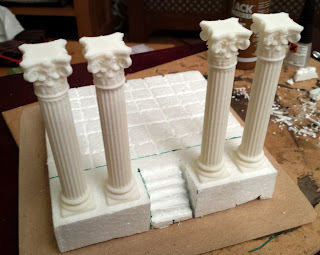 Finding the columns proved trickier than I first intended. I have used wedding cake columns before, but I couldn't get hold of any locally, so I was considering using pieces of dowel and working them up from there. 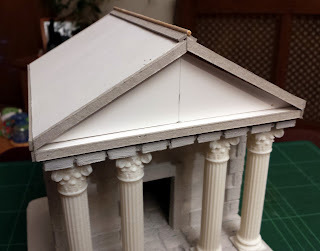 Fortunately, a colleague at work suggest I 3D print them and with a quick hunt around I found some nice fluted columns and Corinthian capitals to sit on top of them. I scaled them and then printed 4 of each. 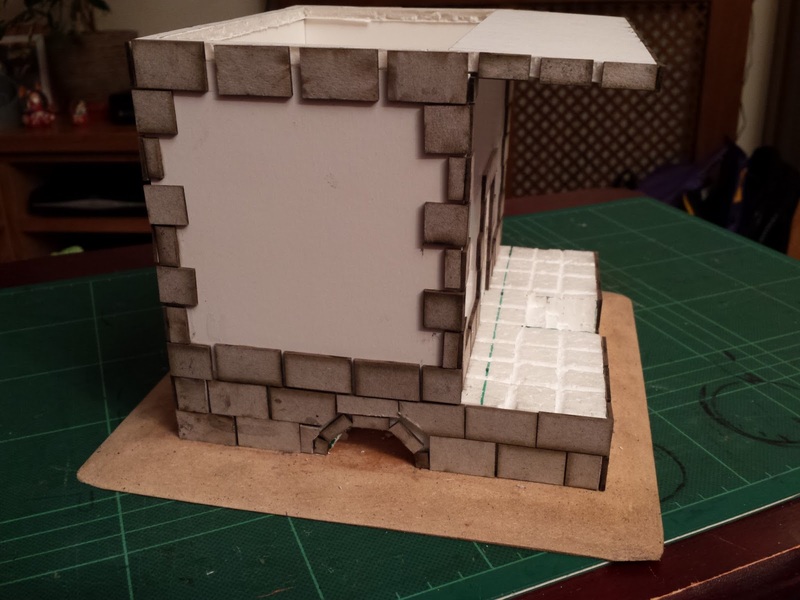 As I mentioned, back at the beginning of this project, I am basing the buildings on 200mm square MDF bases. 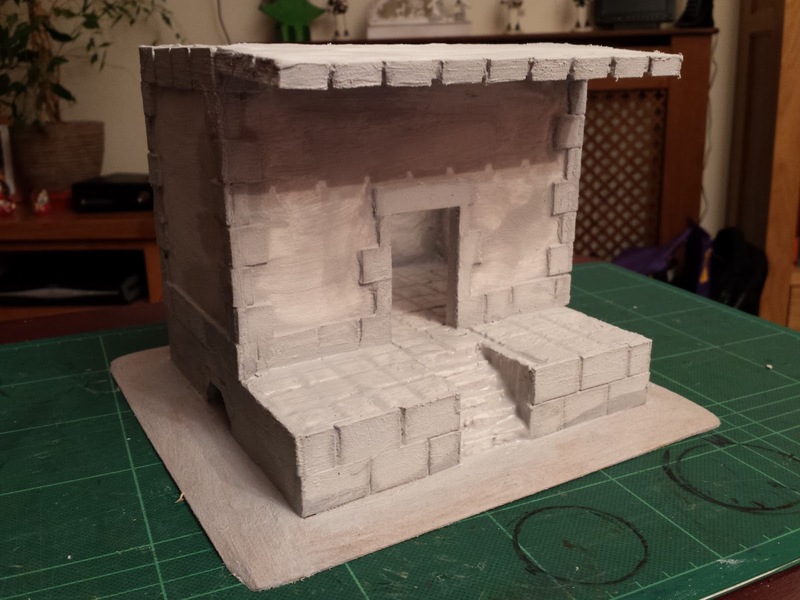 I sanded down the edges to merge with the table and this was just right for the 6" square building. Firstly I cut a 25mm slab of polystyrene. 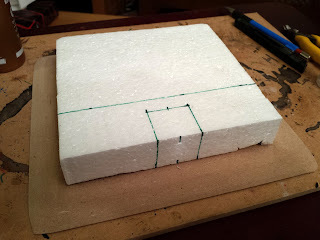 I marked the polystyrene with a line for where the front wall will sit. 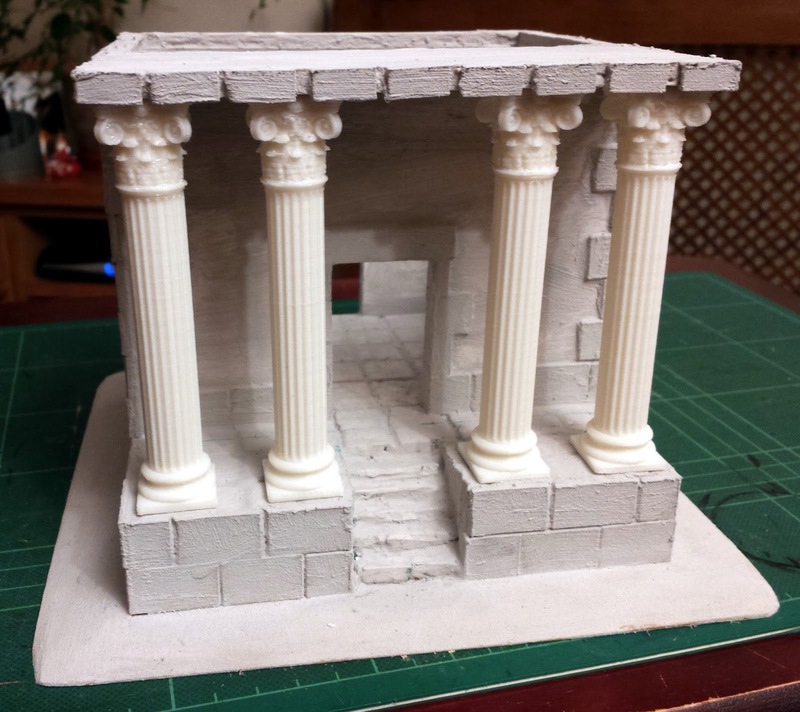 In front of that will be a set of stairs and the columns. The green square at the front is where the stairs will be cut into. I used a hot wire cutter to cut a cube of polystyrene out. 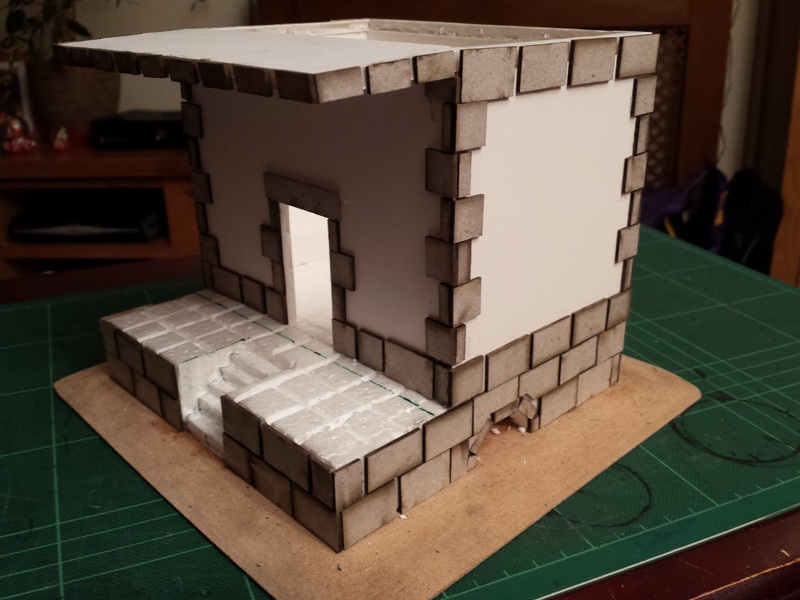 I then cut the steps into the cube and glued it back in place. To differentiate between the floor inside and outside I scored into the polystyrene to give a flagstone effect inside the mausoleum. 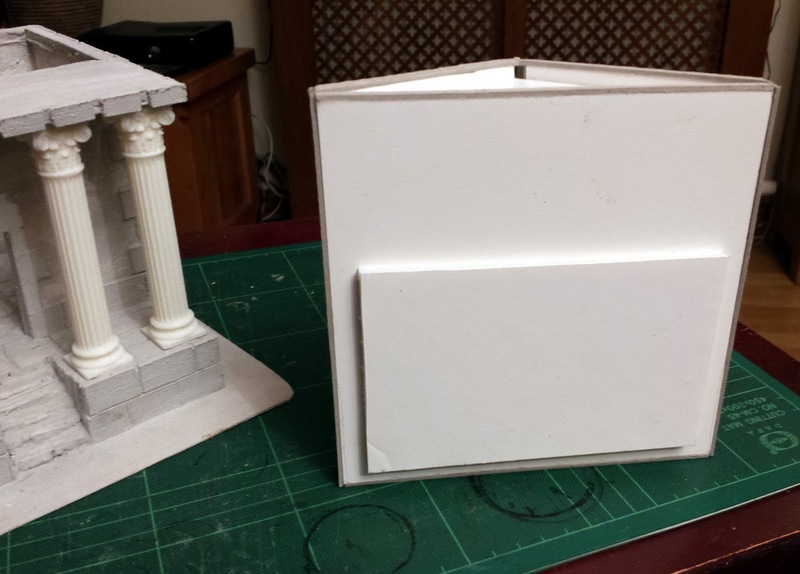 This is about as far as i can go with the plinth that the building stands on. Time to look at the walls. The height of the walls has to be matched to the height of the columns. This is a little higher than I would like, but it does make for an imposing building. 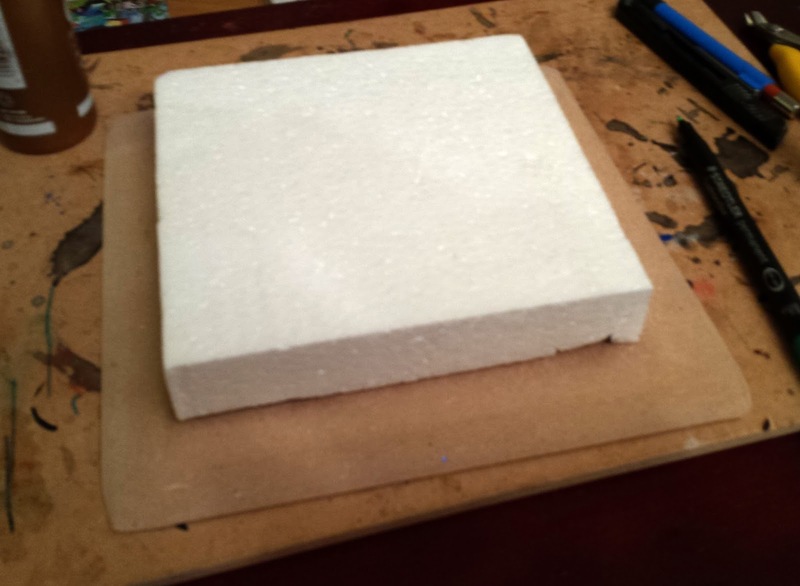 I cut four pieces of 5mm foamcore overlapping the edges to the foam. In the front and the back i cut doorways. 50mm x 30mm for the front door and 40mm x 20mm for the rear door. I will need to add an external stair at the back, but that can wait until later. 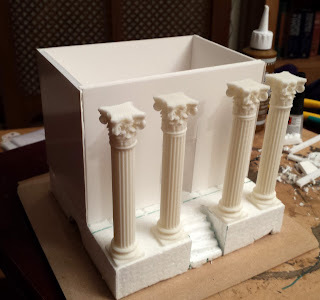 To make access to the model easier during construction I have left the columns off of the model. I have added a first layer of the roof. 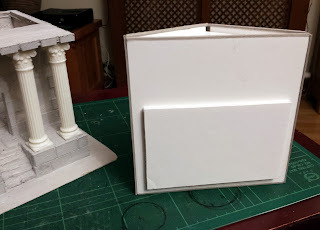 This hides the top of the foamcore and will give structural support for the columns once they are fixed in place. 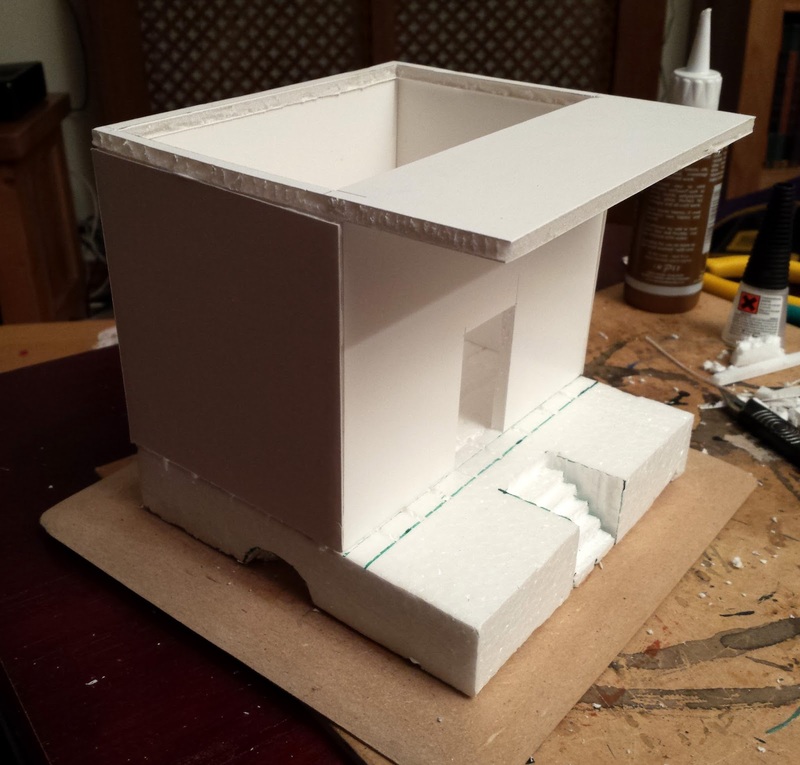 I will build the roof separately so that there will still be access to the interior.